1. 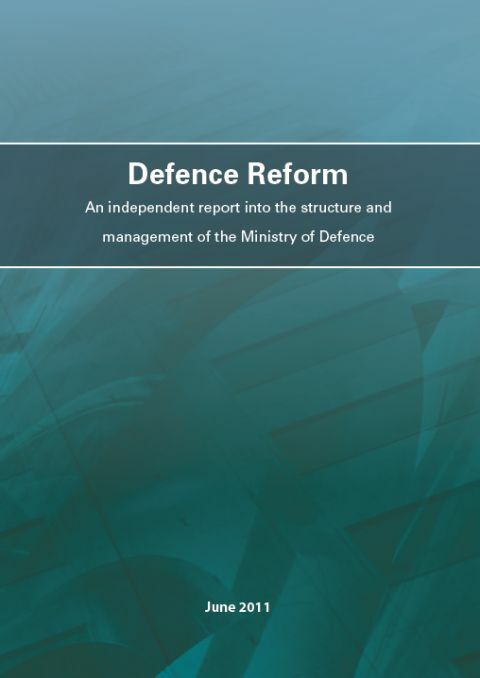 The Defence Secretary launched Defence Reform in August 2010 as a fundamental review of how Defence is structured and managed. It is arguably the first such review since the 1980s. But many of the issues are not new, and have troubled similar reviews over the last century. How centralised or delegated to be? How joint Defence should be? Where the right balance between the military and civilians lies? Some present these issues as choices. We do not advocate such a choice. We believe that an effective MOD is one which builds on the strengths of the individual Services and the Civil Service, and does so within a single Defence framework that ensures the whole is more than the sum of its parts. 2. A key driver for this review has been the Department’s over-extended programme, to which the existing departmental management structure and behaviours contributed. Many of our proposals are designed to help prevent the Department from getting into such a poor financial position in the future, and to put it in the position to make real savings. This is not a distraction from providing the military capability the country needs; it is an essential enabler to it. Ultimately, an over-heated programme simply leads to deeper and less coherent cuts. • manage and use senior military and civilian personnel more effectively, with people staying in post for longer, and more transparent and joint career management. 4. These recommendations are only the first step. It is the people in the organisation at all levels who will need to make it work. We therefore conclude with recommendations on implementation and behaviours. Implementation must be driven by Ministers and the senior leadership of the Department. They will need to lead by example by acting in the ways on which the success of the new model depends. Crucially, they must take the tough decisions needed to balance the books, without which this model, or any other, will fail. 5. Taken together, we believe these recommendations, will create a model for running Defence that ensures that the whole is more than the sum of its parts and which has affordability at its core. That is what is needed if we are to have an organisation that is effective and efficient in delivering one of the most important roles in Government. 1. In undertaking this fundamental review of how the Ministry of Defence (MOD) is structured and managed, we have been mindful of the sensitivities that, inevitably, are involved in an exercise of this kind. Equally we have been conscious of the need to draw on the expertise that exists within the Department and outside. We have therefore consulted widely before reaching our conclusions. In so doing we have been struck by the level of support for our work. Many regard Defence Reform as a significant opportunity for the MOD. A number of reviews and reforms of the Defence organisation have been undertaken over the years but these have tended to focus on particular areas of Defence business rather than the operating model as a whole. Arguably, there has not been a ‘root and branch’ review of Defence organisation and management since the work which culminated in The Central Organisation for Defence White Paper of 1984, and the New Management Strategy which followed, when the institutional, financial and operational context was very different. Many of the individuals to whom we have spoken regard such a review as overdue. 2. In this work we deliberately started with a blank sheet of paper and considered what the fundamental building blocks of Defence are and how they should fit together. The resulting report provides the top level framework for Defence and a clear direction of travel for the detailed work that the Department will now need to conduct. It does not, and did not seek to, answer every question about how Defence works. That approach reflects our remit from the Defence Secretary. 3. For example, in line with our terms of reference, our work has focussed on the organisation of Defence itself, so the report only touches on the MOD’s interaction with wider Government, including the National Security Council. We have concentrated on the way Defence is managed, rather than on the command of operations. We have sought to develop a cost-effective model for departmental management, which should enable the Department to make significant reductions in running costs and get greater value for money from its budget. In some areas we have identified specific savings measures, but that has not been our principal objective. To do so would have duplicated work the Department has been doing in the Strategic Defence and Security Review (SDSR) and since, to make the future programme affordable. Instead, our focus has been on designing a model which should help prevent the Department from falling back into such a parlous financial situation in the future. But we are also confident that the sum of our recommendations will result in and enable very substantial savings when implemented. 4. Whilst tackling problems in Defence acquisition must be a high priority, we regard Bernard Gray’s appointment as the Chief of Defence Materiel (CDM) as key to reforming this area. We have focussed on the responsibilities, authorities and accountabilities of the Head Office, military users and Defence Equipment and Support (DE&S) - including the CDM himself - in the Department’s model for delivering military capability and managing its finances, but we have not sought to duplicate the work Bernard Gray has set in hand on the future functions, structure and size of DE&S, and its relationship with industry. We understand that he will report to Ministers later in the year. 5. In addition, the findings of the review of how the Armed Forces undertake force generation that the Defence Secretary established late last year to run in parallel with Defence Reform will be reported separately. • brings transparency, standardisation and professionalisation to enabling processes, both to enable efficiency and to move towards filling posts with the right individuals, with the right skills, for the right length of time. 7. We wanted to expand here on two particular issues. First, the role of the three single Services. We are in no doubt that they are the rocks on which Defence is built, and important national institutions in their own right. But we believe equally strongly that Defence must continue to take the opportunity a joint approach can offer to enhance operational effectiveness and administrative efficiency. These aims are not contradictory. In our view the Department can deliver a more efficient and effective corporate approach without diluting the strengths of the three Services. Our recommendations will be unwelcome to some. But change is needed, and we are in no doubt that an increasingly unified Defence organisation can be better than the sum of its individual parts provided the Department is clear who is responsible for what; empowers those individuals accordingly; and, above all, robustly holds them to account for their performance. 8. Secondly, there has also been much discussion about whether the model should be centralised or delegated. We do not advocate such a choice. The model we propose involves a strong Head Office to provide strategic direction, make the major balance of investment decisions, set a clear control framework and hold its delivery units to account, and delivery units which have the levers they need to run their business in line with that strategic direction and their budgets. Within that overarching corporate framework, some decisions are best made centrally and others should be devolved, some services are best provided corporately, others are best performed in the delivery units. Each needs to be worked through on its own merits, and this is what we have done. 9. A few points on implementation. First, the recommendations are a package, with mutually reinforcing checks and balances, and must be considered as such. Secondly, if the Defence Secretary agrees the recommendations, we believe that implementation should start promptly, be properly planned, and proceed at pace; otherwise it will not happen. Thirdly, implementation will need to be properly resourced and policed, to avoid the intent being diluted or deflected. Fourthly, the hardest part of any reform such as this is effecting the changes to behaviour necessary to realise the organisational and process improvements; they will need strong leadership and particular focus in implementation. 10. Finally, no organisational model can work unless its senior leadership takes the tough decisions that reconcile ambition with reality. Some of the perceived problems of the current model are simply symptoms of the friction caused by the lack of such decisions in the past. We have not identified a silver bullet to the financial challenges that Defence faces today. Resolving them means some unavoidably tough choices about priorities. We believe our proposals should provide a better framework to make those decisions. But they will still need to be made. If they are not, this model will fail too. 11. We are conscious that we have undertaken this work against a backdrop of intensive operations in Afghanistan and, lately, in Libya, where our Servicemen and women are doing extraordinary things day in day out. This has served to emphasise the importance of our task. We are in no doubt that the proposals set out in this report provide for a department that will be better placed to serve the Defence Secretary and his successors, and to direct and support those men and women on the front line, now and in the future.